I’m practically laid out on the couch, cosying up to an ice pack right now (Thank god for laptops.) having done something again to my back. Stretch, ice, advil, repeat. Needless to say, the weekend has not been very active. One errand yesterday and brunch with a friend today before I had to make nice with my back and hang out on the living room floor staring at the ceiling. You know what lying on the floor shows me? That I really need to vacuum more. So, no baking or cooking today, but luckily I have saved up this little chewy lemon cookie recipe for a rainy day (of sorts). If you’ve been on this blog long enough, you know how much I love lemon. In fact, some may say it’s an addiction. And that means when I see a good-looking lemon-centric recipe, like this one for Chewy Lemon Cookies, it isn’t long before I’m making it. I was also intrigued by the idea because I absolutely adore the Lime Sugar Cookies I often make. There are very few things these two recipes have in common, other than a citrus focus. But they’re both fantastic in their own way. I loved these cookies for the chew and crackled top. Plus, of course, the lemon-y flavour. I baked them off on a Saturday and shipped about a dozen off to the Sunday crew at the Herald because even though I’m not there on the weekends anymore, it doesn’t mean I can’t take care of my girls. Their grateful tweets made it totally worthwhile. As some of you know, I’m a terrible procrastinator and have been sitting on this recipe for two weeks. A friend has been gently reminding me to get it up because she wants to make them herself — that’s how good they are. 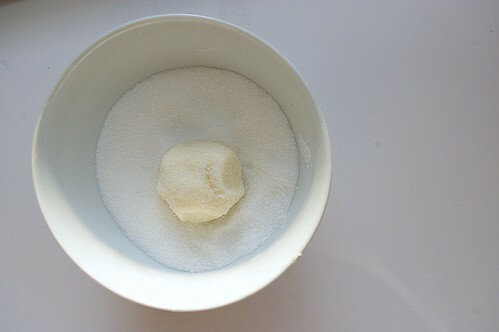 In a larger bowl, beat together butter and sugar until light and fluffy. Beat in egg, vanilla, lemon zest and juice. Add in dry ingredients, beating until just combined. 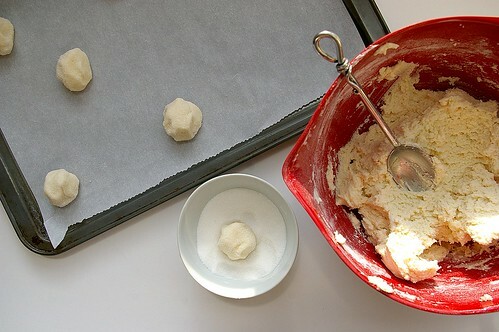 Roll rounded spoonfuls of dough into balls and then roll in sugar. Place on lined cookie sheets, about 1 or 2 inches apart. Bake for 8 to 10 minutes. (Mine needed barely 8 minutes; they were not yet golden but I wanted them still pale and tender.) Remove from oven and let stand on cookie sheet for 2 minutes before removing to cook on wire racks. Makes 24 – 36 cookies. Hooray! And hooray for “gentle” reminders, haha. Just doing my part to spread the lemony goodness to the world. These look delicious! I, like you, love all things lemon. Have you ever made them then frozen them? I’m trying to make holiday stuff ahead of time (so we won’t eat it all!) and if these freeze then that would be great! If not, I’ll be making them anyway! Hope you feel better! Jane, I haven’t tried freezing them, so I don’t know if that will work. Let me know if you try it because I’m curious! Wow! These look delicicous! I will definitely try these SOON! Thansk! These look so perfect! I’m starting my holiday baking late this year so when I start, these are going on my to-bake list. hi there and thanks for the little bits of pleasure i occassionally find in my inbox. i am still in the process of making these cookies. they are DELICIOUS, but raw???? i’m still cooking them —way past the 8 minutes in the recipe. i can’t even take them off the baking sheet because they are falling apart they are so raw. do you have some super bionic oven? the few that are finally done are simply divine. next time i make them i’ll adjust the oven temp and cooking time (and increase the space between them.) but i’ll definitely be making these again. Christina, I’m sorry they were taking longer for you to bake! I made my cookies quite small, so that’s probably why they were done in 8 minutes. It sounds like you’ve found the solution, though. Hopefully you’ll give it another go with greater success next time! Generally I lurk, but I had to tell you how wonderful these cookies are. They’re THAT good. I love a recipe that claims to be “chewy” and delivers. I added a teensy bit more lemon juice to offset the sweetness of the white chocolate chips I threw in. Thank you so much for providing an excellent addition to my Christmas Cookie Exchange. Wow. I made these cookies for my mother because she is on a lemon-kick right now. I didn’t expect much because I, unlike my mother, was not aching for anything lemon-like. When I made the dough, I was not impressed with the taste, but I still expected the resulting cookies to taste good. Well, they tasted BETTER than good; they were AMAZINGLY good, soft, with just the right amount of sweetness. Next time I will add more lemon juice so that they can be more sour, but they are actually amazing as is. I ended up eating an embarrassing amount of cookies before my mother’s arrival (she still isn’t back yet). I am locking myself in my room to avoid eating the whole lot so that she can have some hahaha. Thank you for a fantastic, unforgettable recipe. P.S. Oh! About the baking time – I had to bake mine for an average of 9:30-10 minutes, and my cookies were small- to medium-sized. I also made sure to leave the cookies on the hot baking sheet for 2-4 minutes before placing them on the wire rack. I’m grateful for that tip. I have made these twice just this week! Once for a cookie exchange, the second time for me! For the second batch I took half of the dough and added a cup or so of chopped cranberries. Uhm, yeah, so yummy! OH MY GOD! This is what my son and husband said upon tasting these cookies. We love lemon bars. we love sugar cookies. These are like a great cross between the two. Totally great. Thanks. I made these a few days ago: subtle and delightful! ahh these look so amazing and summery I cant wait to try them out! Hi, found this site through Google while looking for lemon recipes. These turned out easy and quick to make, looking nice and quite pleasant to eat, too. Perfect for family gatherings and coffee parties! I wouldn’t call mine chewy, though – they’re a bit crispy on the edges and crust, and nice and soft in the middle. Lemon flavor is quite mild, perhaps because I only had a small lemon to use. Baking time was about 13 minutes in a fan forced oven at about 175 Celsius, I took mine out just before they started getting brownish. I got 43 of these to have and share. 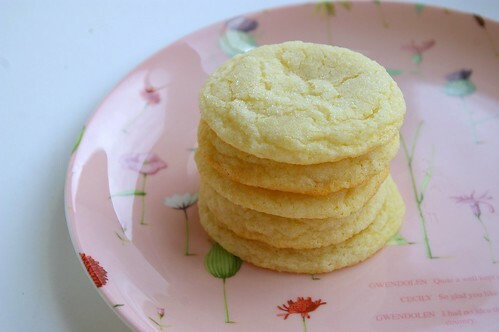 I came across your blog by looking for lemon cookie recipes. The recipe looked pretty simple, and I’m not much of a baker, so anything that has too many steps I’ll either not want to attempt, or I’ll mess it up somewhere. I was a little worried when I tasted the batter. It was terrible! I thought it tasted like play-doh (if childhood memory serves), but I went on anyway just hoping the baked product would be better. It definitely was! These are really good, I sprinkled some extra sugar on the top (the leftover from what they were rolled in), and made them really big, so the baking time took a lot longer. Pulled them out before they were browned since I always think cookies taste better that way. The lemon taste isn’t as strong as I was expecting/hoping, so I’ll add more zest next time. I saved your recipe since I plan on making them again. I put some of the leftovers in the freezer and they taste great that way too. I was thinking they would make delicious ice cream sandwiches! turned out perfect!!! Love the light yellow color they turn and soft texture. I baked off a dozen right away then portioned out the rest of the dough- froze that and have been baking out a dozen or so at a time. Just pop them out of the freezer roll in sugar and bake- they turn out perfect! Tried there, was they came out perfect!! Loved the flavor and texture. I halved all the quantities and used a small sized egg – made 15 big round cookies. Will definitely be making these again & again. Many thanks for sharing the recipe! Hi Ashley, you can use bottled lemon, but I really recommend going for fresh if at all possible. The taste is much better and, of course, the zest adds a ton of lemon flavour. If that’s just not an option, you’ll need about the same amount of juice. The recipe calls for 4 tablespoons. As for the shoes, thanks! I got them at Winners, actually. They were an excellent find. Good luck with the cookies! Have you ever made anything with fresh Lemon Verbena? We just got a plant and it smells like lemon heaven! I love the smell of it but have never had an opportunity to use lemon verbena. What do you do with it? So far we’ve made fresh lemon verbena mint tea. Which was fantastic and I could drink it every day if I had a bigger plant. 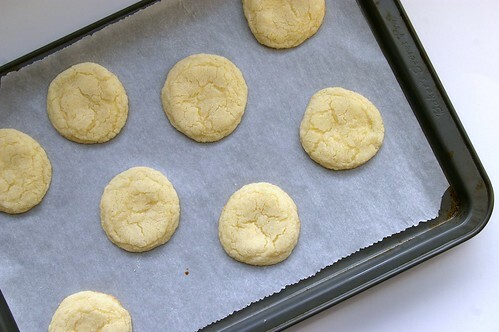 🙂 I’m making your lemon cookies right now…just trying to figure out what to do if I don’t have parchment paper…I’m guessing just put them on the sheet ungreased, but we will see. Yum, I made these for an event at my church and they turned out really well…chewy and delicious! I just want to say this is a great recipe. I just baked this lemon cookie and it is chewy and yummy! I usually like my sweets not much sweet, so I plan to make mine with less sugar and more lemon zest to add more lemon flavor next time. Maybe lemon icing instead of rolling on sugar. This is what I will bring to my Christmas party this year! THX much! I just tried these cookies and couldn’t be happier… a little crisp on the outside, a little chewy on the inside, lemony, light, and pretty. Perfect. Next time I’ll decide either to be very very careful when adding the sugar, or maybe cut it down just a bit. Thank-you for the recipe these cookies were DELICIOUS! The recipe made about 100 cookies. This recipe is superb! I was a bit in doubt of the ‘chewy’ part, until the inside of the cookie amazed me. Had a blast making them and sharing them with friends. I even took the liberty of making star-shaped ones with regular cookie cutters and well.. they are a bit overpuffed (Is that a word?). I see that the dough isn’t meant to be made into delicate shapes, but not bad, not bad at all. It’s mostly in Korean so you can just scroll down to get to the pictures. Hello! I made these on a whim, at 10.30pm last night (they’d been gnawing at my mind). I’d never had lemon cookies! I love them – so buttery and light. Thank ye, thank ye. I chose your recipe for my lemon craving 🙂 I added dried lavender to both the cookie and the sugar. They turned out just as i imagined!